Andasreth is a stronghold in a pocket desert of the West Gash region. 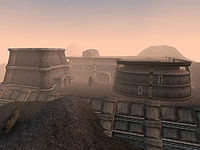 It is one of the ancient strongholds from a brighter time for the Dunmer. It can be found north of Gnaar Mok, just over the mountains north of Khartag Point. The strongholds seem interesting to the traveler, but should be approached very carefully. They have largely been abandoned, but have since generally proved attractive to whatever group feels strong enough to hold them. At last report, Andasreth has been taken over by bandits. Four dead Redoran guards, presumably killed by the bandits, can be found on the Lower Level of the stronghold. Two hostile bandits, Athesie Andas and Folvalie Omalor offer training services if successfully calmed or snuck up on. Andas offers major training in Short Blade, Light Armor, and Sneak while Omalor offers medium training in Short Blade, Light Armor, and Sneak. Andasreth has a propylon chamber linking to Hlormaren and Berandas. Recover Shields from Andasreth: Find four soldiers who disappeared in the Andasreth Stronghold. The Andasreth Propylon Index can be found on a shelf in the dome on top of Hlormaren. It is illegal to sleep in Andasreth. This page was last modified on 8 September 2018, at 03:43.